I know that many you have been waiting to see the results from my Hunter's Star Class. Also, I know that some of you had never even heard of a Hunter's Star. If you weren't able to read my first post about this wonderful block, just click here and then come on back. 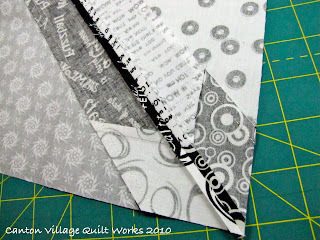 Well, all I have to say, is that if you decided to go ahead and purchase that wonderful Petite Rapid Fire Hunter's Star ruler, you have made a great investment in your quilting tools, for sure. Here is the first 4 blocks up on my design wall!! Very scrappy and all from my stash. Now traditionally this block is done with 2 fabrics. Well, of course, I can't seem to be traditional. So I did a two color version, but made it totally scrappy. I love the effect! Here you can see the star form. When all four corners of the block meet they make this wonderful Hunter's star. The neat thing about this method is that it is all strip pieced. You never have to cut any diamonds!! On the back of the block, she has you press the seam open. The reason behind this is because when the corners all meet up to form the star, there would be way too much bulk and would not lay so flat. By the way, bulk is a longarm quilter's nightmare. When my customers give me something that is bulky, it is definitely much more difficult to quilt over those areas because the hopping foot just can't make it. Then the foot needs to be adjusted. It is just better if the seams lay flat, for sure. Here you can see the corner where the star will form. Oh, and by the way, this block is made slightly larger than you need. 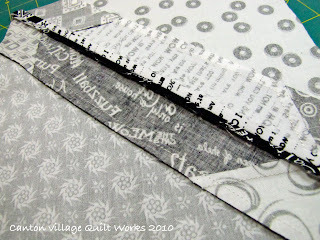 I say this because you trim it down with the ruler and every single block is not only the right size but just perfect!! 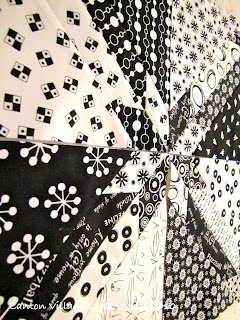 So the whole quilt should go together with ease. Now I just need to get the rest of the blocks up on the design wall. I will continue to show you my progress and some final photos from the class too. 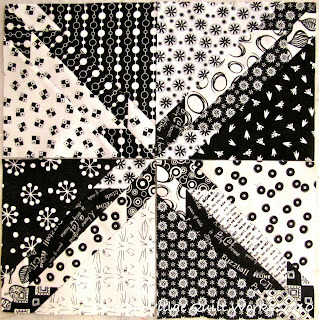 In the meantime, check out the new customer quilts that have been loaded to my gallery.